Grandes lignes: Story of Barabbas dramatized. Compares him to the listener-- Jesus came and died to set us free, took our place just as He took Barabbas' place. Ends with sinner's prayer. 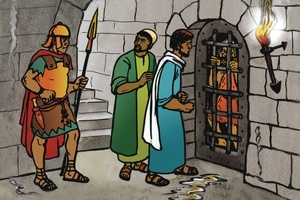 A certain wicked criminal named Barabbas was in jail. (Pause 3 sec.) Very soon he was to be nailed to a cross and crucified, and two others with him. There was also another man, named Jesus. He was also going to be killed, but He had done no wrong. He was different from Barabbas. He only did what was good. He was holy and pure. Jesus Christ was God's Son. God loved all people and sent His Son to save them from their sins. Jesus was in the world and the world was made by Him. But the world knew Him not. The people of earth treated Him shamefully. Rough men arrested Him. They told lies about Him and made preparations to nail Him to a cross. Barabbas was still in prison, and the day was drawing near for him to be crucified. Finally the hour arrived and he heard the jailor coming down the corridor. (Pause 3 sec.) He heard the key turn in the lock. (Pause 3 sec.) He knew the time had come for the punishment he deserved. The jailor said, "Barabbas!" The prisoner's heart beat fast. "Barabbas - you are free! Jesus Christ of Nazareth is to be crucified on your cross in your place." "What? Free? How can it be that I, Barabbas, am set free! The jailor says that Jesus is to die instead of me. What wonderful news!" And Barabbas was set free, although he deserved the punishment. My friends, there is good news for you, too. Although we are all born prisoners, we can be free. We are bound to our own desires. Jesus willingly took our place. Because of our sin we deserved death. But Jesus died in our place. Thus He made the payment for our sins. We can be free if we accept Jesus and His death for us. God's Word tells us of the death of Jesus, and it says these words about Him: "He carried in His own body our sins on the tree, that we who are bound to our sins, should be set free to live as God wants us to." God says Jesus..."was wounded for our transgressions, He was bruised for our iniquities. The chastisement of our peace was upon Him and by His stripes we are healed. All we like sheep have gone astray, we have turned every one to his own way, and the Lord has laid on Him the iniquity of us all." This is true. Jesus gave His life to pay for our sins. But Jesus arose after three days. He went back to heaven. He is alive. You can pray to Him. Would you also like to be free from sin? If so, pray and say to Jesus, "You are my Saviour and my Lord. Forgive me and receive me. I want to follow You. Thank You for setting me free from sin and eternal punishment by dying in my place. Help me to live only for You always, and to tell others about You." He will forgive you and give you eternal life. Believe Him and He will receive you. GRN has recorded a version of this script in 163 languages and dialects. See full list. See different versions of this script in Portuguese, Spanish, Tok Pisin: PNG.